We thought my parent’s pool would make a lovely setting for some pictures. 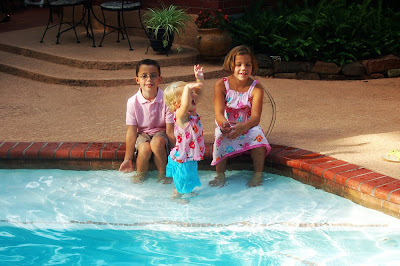 Too bad we didn’t think about our toddler getting in the water and soaking her matching outfit! The Week in Review: I’m pretty sure my latest visit to Wal Mart will be mentioned in the Employee Handbook, Ch. 2 on Unruly Guests. And we started swim lessons, all of us. In a moment of insanity, I signed up to take a Mommy & Me class with the toddler. After 2 lessons in frigid water, I’ve been rethinking the need to learn to swim, after all. And now, I’d like to introduce you to Heather of Wanting What You Have. She submitted this post as her entrance into this prestigious, ahem, society! matter – God, and family. that I would die of boredom before the baby arrived. out of control. It’s normal. through “the pile” for their Legos, but I DIDN’T CARE! Thanks for featuring me Kristen! I’m pretty sure that the employees of our local Wal-Mart feel a sense of impending doom every time they see us coming through the doors. Don’t feel bad, it’s not just you. Ooooo, great idea sweep all the toys into a pile! Have a great Sunday! I just found your blog and have to say, I love it! I don’t even know how I got here, but I have been so entertained by your posts. It’s so nice to know that we’re not the only “That Family” out there too! I’m hooked! Thanks! Great to meet you Heather. It is so liberating to realize that you are what you are and you just don’t care!!! I LOVE Heather’s blog!! I read it every day 🙂 She’s got really great tips, and is so very real. Kristen – you’ve done it again! You’ve inspired me! I love the picture – pictures that truly show what your life is really like are the ones I treasure more than any old portrait.